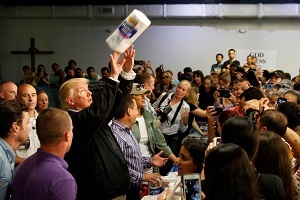 But at least he was kind enough to toss paper towels at them. The President’s incredible protestations notwithstanding, the Puerto Rican relief effort was botched from the beginning. (7) This month over one million Puerto Ricans still have no electric power, more than one quarter of a million lack clean water, and more than one thousand people have died. (8) Is that “real” enough? The reality doesn’t seem to matter. What does matter is that Trump’s insulting Puerto Ricans plays to his base. So calling Puerto Ricans names, insinuating that they are lazy and not worth the money spent on them, and referring to them as “politically motivated ingrates”(9) gives him an advantage with his voters. What better reason to engage in such self-degrading behavior? All generalizations have exceptions, about which we need to be careful. Nevertheless, it is time to stop the sympathy for the “disadvantaged” and angry voters who form the core of the Republican base. No one deserves sympathy for saddling this country with the most clearly unfit and unqualified President in its history. Trump engages in race-baiting and stereotyping because it pleases his constituency. So much so that many will even vote against their own economic interests because Trump “sounds like us” and makes their prejudice acceptable. The most salient factor motivating Trump’s core base is racial resentment. (10) This “trumps” even the economy. This resentful minority is now able (largely because of the anomaly of the Electoral College, which ceased long ago to function as the Founders intended) to dictate narrow-minded and destructive policies to the rest of the nation. While our system allows for that, it does not entitle them to sympathy. If we as a nation are to emerge from this moral crisis the Republican base must not just stop receiving our sympathy; it must be repudiated. Ethnic hatred must cease to be the fuel driving our public policy; otherwise the consequences could be catastrophic. Puerto Rico is more than just an island. It reflects our own values back at us, showing us what we are, what we have become. Do we like what we see? Are we even looking? We have colonized these people and used their resources for our benefit. When they are crying for our help, our response sends	a message that will be heard far beyond San Juan, Bayamón, Carolina, and Ponce. (1) Katehrine Skiba, “Trump Sees ‘A Lot of Happiness’ Among Houston Families Forced from Their Homes by Flooding ,” Los Angeles Times, September 2, 2017. (3) Chris Cillizza, “Trump Sent 18 Tweets on Puerto Rico on Saturday. And Made Things a Whole Lot Worse,” CNN.com, October 1, 2017. (4) Reuters Staff, “Trump Says Puerto Rico Has Thrown Budget ‘Out of Whack’,” Reuters, October 3, 2017. (5) Olivia Beavers, “Trump: FEMA Can’t Stay in Puerto Rico Forever,” TheHill.com, October 12, 2017. (6) Kaitlan Collins, “Trump Contrasts Puerto Rico Death Toll to ‘A Real Catastrophe Like Katrina’,” CNN.com, October 3, 2017. (7) Frances Robles, “Contractor for Puerto Rico Power Suspends Work, Citing Unpaid Bills,” New York Times, November 21, 2017. (8) Jennifer Bendery, “The GOP’s Tax Bill Kicks Puerto Rico When It’s Down,” HuffingtonPost.com, December 19, 2017. (9) Jill Colvin, “President Trump Scoffs at ’Politically Motivated Ingrates’ After Maria,” Boston Globe, October 1, 2017. (10) German Lopez, “The Past Year of Research Has Made It Very Clear: Trump Won Because of Racial Resentment,” Vox.com, December 15, 2017. (11) Jennifer Bendery, ”The GOP’s Tax Bill Kicks Puerto Rico When It’s Down” (see note 8). (12) Colin McCullough, “Cruz: Election was revenge of ‘flyover country',’ CNN.com, November 18, 2016.